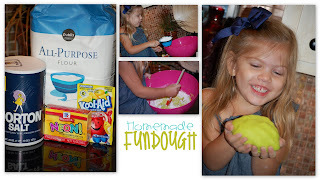 Mix all ingredients in a bowl and mix with hands into one large dough ball. Put in an air tight container for the next day. I've found if you make it the night before it is far less sticky. I slid it into a plastic page protector to keep the surface fundough friendly, and so I can reuse the letter mat throughout the week. I also had Kaitlyn trace the letter with her finger as well as use her pom pom's to outline the letter. She helped me name the colors and count the fruit as we read the story. 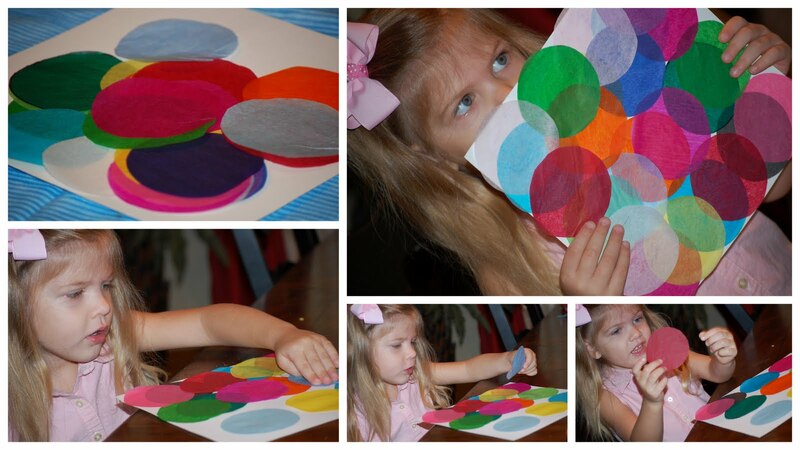 First I had precut several circles out of tissue paper in all colors. Then I had Kaitlyn glue them on to her 10X10 paper, naming the colors and counting as she went. 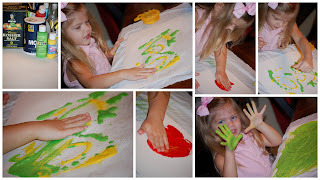 Then we started our Finger Salt painting, we will let this dry overnight so the salt crystals set with the paint. I squeezed green and yellow paint onto Kaitlyn's paper. She took a few pinches of salt and Kosher salt onto her paper. Then she spread the paint around with her hands. After she was done with the green one we did a red one in the same way. We will save both of these till Wednesday and finish our Letter C page for our ABC book then. Which we got from the Public Library, a great resource for kids this age. Kaitlyn loves picking and choosing her own books and reading them each night. this story is all about colors and numbers. 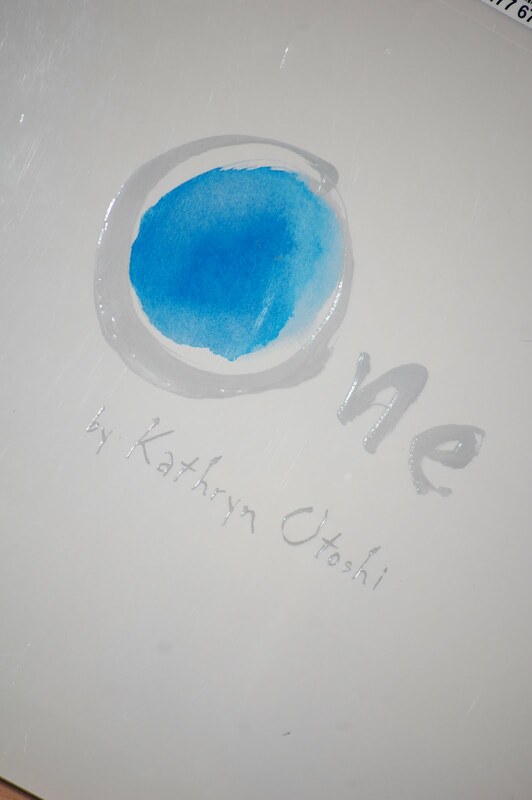 It is a great book for teaching the color names, what a number looks like and basic counting skills. 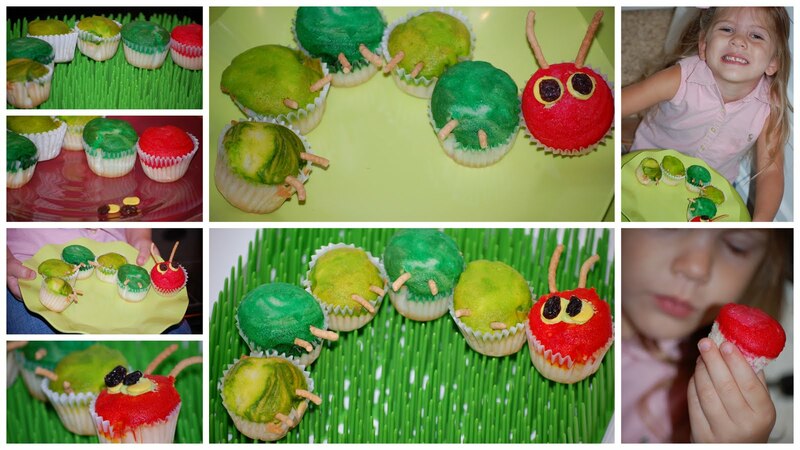 To reinforce the book we got started on our Colorful Caterpillar Cupcakes! Kaitlyn helped me make the cupcakes in our Mixer. 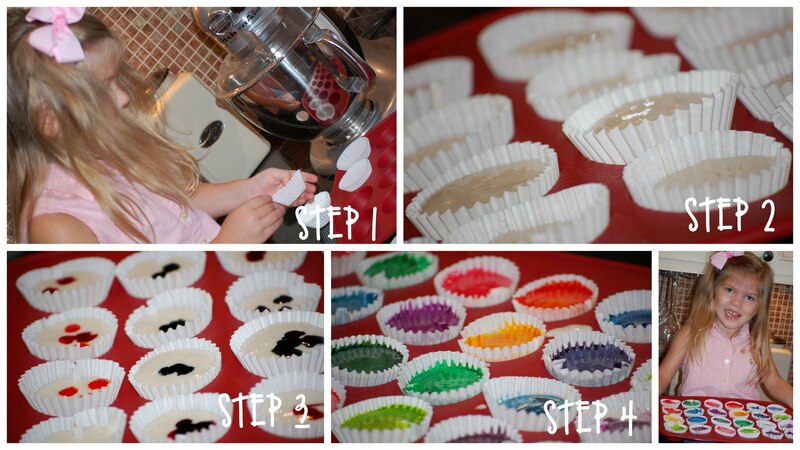 I had her count out the muffin wrappers and place them in the muffin tin. 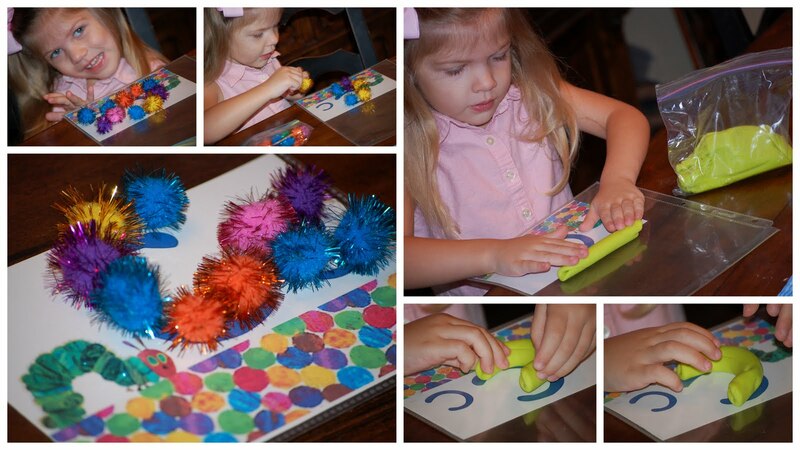 Perfect review and helps to teach her one to one number correspondence. After the cupcake wrappers were filled with batter. 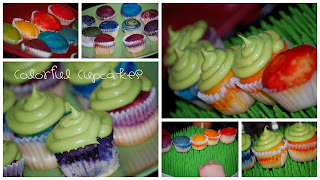 I sprinkled a few drops of food coloring into each cupcake (step 3). 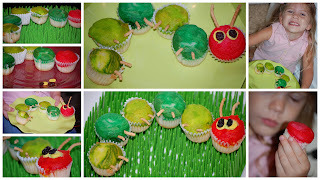 I had Kaitlyn stir them with a toothpick (Step 4) and then put them into the oven to bake! She was so excited when they came out all colorful! We separated the cupcakes and sorted them into color groups for two cupcake projects. We didn't ice these because they were so colorful already. 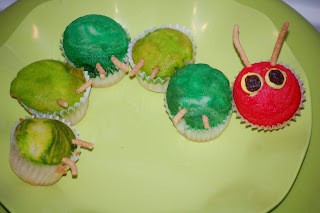 We used some crunchy Chinese noodles for his antennae and his legs. We used some round yellow candy sprinkle dots ( Target Cake dept. ) and some raisins for eyes. Kaitlyn was so proud of her Very Hungry Caterpillar! 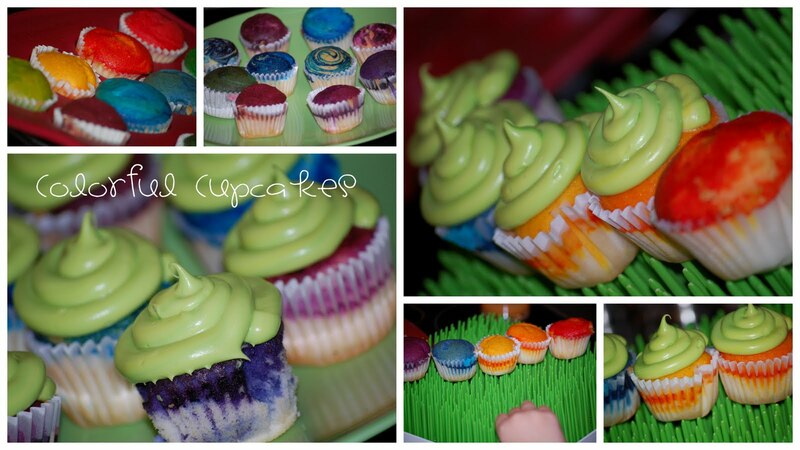 Our second project was Sorting and icing all of the colorful cupcakes. 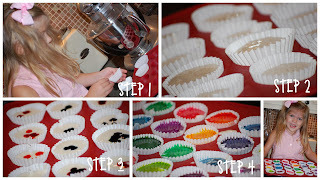 Kaitlyn counted them and put them into groups, we reviewed all the skills that she learned today with this fun and yummy activity...Thank goodness we have playdate this afternoon and we will have some help consuming these yummy cupcakes! 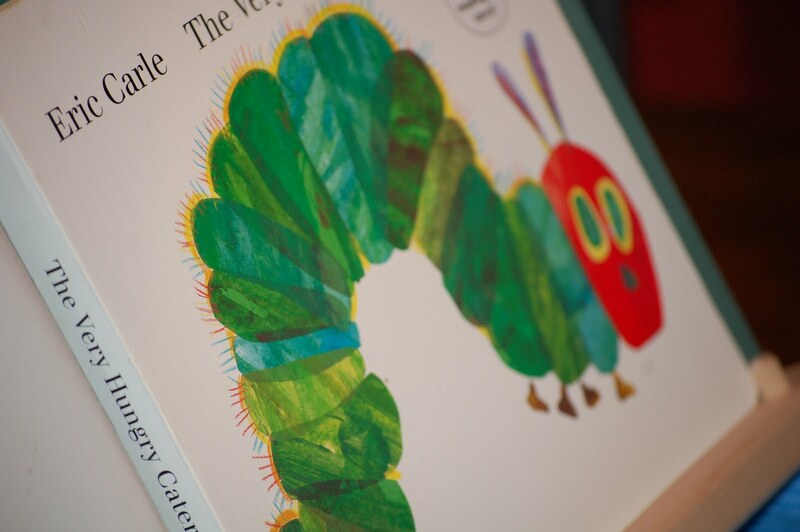 Join us Wednesday as we explore patternpillars, finish our Letter C page and make our very own Very Hungry Caterpillar necklace!